We do a lot of sports field construction and renovation analysis as part of the typical project bidding and estimation process here at TMC. To help out with this job, a lot of time is spent using Google Maps so that means we get to see many different sports fields from an aerial perspective. This different perspective provides a view of turf grass that a turf manager just can't get while walking a field. A good example (of bad sports field irrigation) can be seen in these images of two high school sports fields. 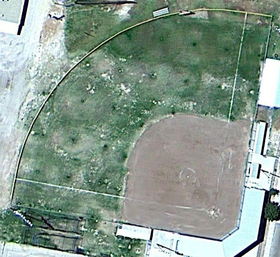 Note the prominent "crop circle pattern" on both the baseball field and the softball field turf grass areas. Each circle shows the spray pattern by every individual irrigation head. The light areas all over the place are spots where the turf grass doesn't get adequate water (or any water at all in the worst spots). It seems the irrigation systems on these fields were installed in a very standard row-based configuration with no applied knowledge of the practical, real world aspects of quality sports field irrigation. Systems like these are installed all over the country by landscaping companies attempting to build sports fields and are one of the many reasons athletic fields fail from a performance stand point. In spite of having a ton of heads installed on these fields at seemingly decent intervals (most appear to be 30-40 feet apart), it's clear that these irrigation systems are not achieving adequate coverage. It's very likely the water pressure is inadequate and/or the nozzle size and type for each irrigation head is incorrect. One thing I will note here...these fields are in West Texas, where the wind is constantly blowing. This is a very important factor to take into account for designing and installing irrigation for sports fields. Ensuring heads are close enough and properly calibrated to overlap in windy conditions is a must. Note the images below. The sports field construction of these two high school fields took place from the ground up with quality sports field irrigation in mind, designed and installed by TMC right here in Kerrville, TX. Nice, even irrigation, properly calibrated for the irrigation conditions at the site.